Visit eVoice online at eVoice.com which offers the most advanced suite of virtual, on-demand voice communications services. eVoice's unique communication system allows mobile professionals, small businesses and independent entrepreneurs to sound more professional and function more productively. eVoice customers receive the quality and professionalism of a Fortune 500 corporate telecommunications system without the costly equipment and fees. Save on your next purchase from eVoice.com with eVoice discounts, eVoice coupons, eVoice promotions and eVoice savings from 58coupons.com. Hurry on over to eVoice.com to sign up for their $29.95 plan with 1000 minutes and so much more. click link to view. Get on over to eVoice to sign up for their $19.95 plan which includes 500 minutes and so much more. Click link for details. 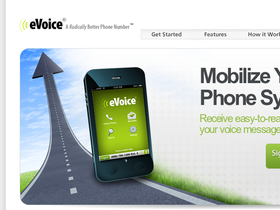 eVoice is offering Plans for a low as $12.95. Click link for more details. evoice.com is offering a free 6 month trial of their services. Includes 1000 total minutes or 60 total voicemail-to-text messages. See site for more inclusions.